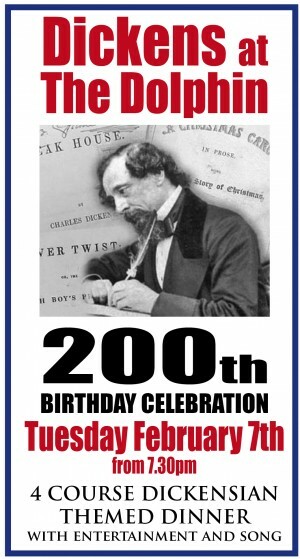 When Charles Dickens wrote of Portsmouth in 1838, the Portsmouth Philharmonic Society was meeting at The Dolphin Hotel every Tuesday. By 1858, Landlord Richard Budd was running The Dolphin Navy, Army & Family Hotel. On Charles Dickens’s last visit in 1866, William Bond was “mine host” at The Dolphin Hotel which then offered a bowling alley as an added attraction. Now The Dolphin is offering a special bicentenary four-course meal based on references from the novels of Charles Dickens. Costumed actors will perform songs from the stage production of 'Oliver!' including "Food Glorious Food", "I'd Do Anything", "Consider Yourself", "Oom Pah Pah" and "As Long As He Needs Me". The cost for the evening is £24.50 per person and reservations can be made in person at The Dolphin, 41 High Street, Old Portsmouth or by telephone to 023 9282 3595 or by e-mail to dolphinoldportsmouth@yahoo.co.uk.